The E-7 Wedgetail provides one of the most advanced air battlespace management capabilities in the world and the Royal Air Force have just purchased five of them. The Wedgetail is an Airborne Early Warning & Control aircraft with maritime search capabilities, the ability to control unmanned aircraft and intelligence gathering capabilities. The Wedgetail is based on a Boeing 737-700, with the addition of an advanced Multi-Role Electronically Scanned Array (MESA) radar and 10 mission crew console. They can cover four million square kilometres during a single 10 hour mission according to the Royal Australian Air Force. 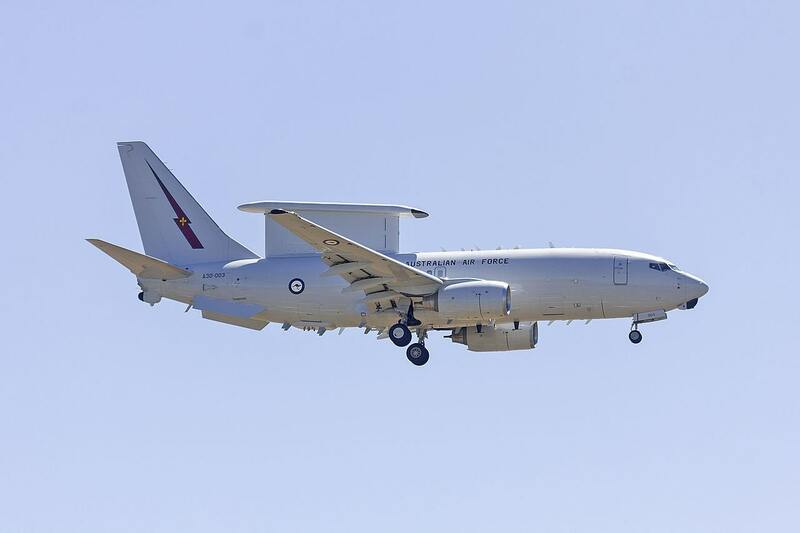 “The E-7A Wedgetail represents an entirely new capability for the Australian Defence Force, providing an airborne early warning and control (AEW&C) platform that can gather information from a wide variety of sources, analyse it and distribute it to other air and surface assets. The (aptly named for a British purchase) ‘Top Hat’ of the aircraft houses the radar. The L-band electronically scanned AEW and surveillance radar is located on a dorsal fin on top of the fuselage, dubbed the “top hat”, and is designed for minimal aerodynamic effect. The system provides 360 degree coverage and is capable of simultaneous air and sea search, fighter control and area search, with a maximum range of over 600km (look-up mode). When operating in look-down mode against fighter-sized target, the maximum range is in excess of 370 km according to Boeing. When used against maritime targets, the maximum range is over 240km for frigate-sized targets. MESA is capable of simultaneously tracking 180 targets and conducting 24 intercepts. Back in 2009, Boeing even demonstrated control of three ScanEagle unmanned aircraft from a Wedgetail. In addition, the radar antenna array is also doubled as an ELINT (that’s a form of covert intelligence-gathering by electronic means) array, with a maximum range of over 850 km at 9,000 metre altitude. Back in 2014, a Wedgetail conducted the first Australian sortie over Iraq supporting coalition forces conducting airstrikes against Islamic State. The next year, another performed the longest Australian command and control mission in a war zone during a 17-hour, 6-minute combat mission, requiring two air-to-air refuellings to stay aloft. Photo by Bidgee [CC BY-SA 3.0], from Wikimedia Commons. Wedgetail looks to be maturing nicely in Australian hands with the major early teething troubles now ironed out. It’s also currently undergoing a major programme of further upgrades, due to be completed in 2022 that we reported on here. The type will enter UK service in the early 2020s. Still waiting for the announcement that Voyager will get a Boom Refuelling capability but, given the number of sole source acquisitions of US kit, would not be surprised if it were retired to accomodate a purchase of Pegasus! I always find it interesting how we ended up with two systems for AAR. Can someone in the UK please explain why tankers were ordered without a boom. It seems totally idiotic to me. Am I missing some clever reasoning? Again Australia has bought more Wedgetails than the UK, they seem to be buying or have more p8s also and they will have 5 more atack submarines than the UK. I know we have more destroyers and aircraft carriers and Nuclear armed subs. But for Australia’s size they will have lots of great gear in future. A great Allie and I hope we work more with them in future, they should join the Tempest program along with Canada. I get the whole “too many chefs spoil the broth” but I would agree that Aus would make a good partner for Tempest. Afterall it’s designed to be a technology demonstrator right? So with flexibility and modularity in mind, perhaps Tempest could be configurable for different nations but specifically based around a common frame. Interested to see where this leads! With the size of the areas they need to cover then no wonder they bought more P8. They are not SSNs and not in the same league. Per Unit price of the Attack-class is very close, USD wise, to the Virginia Class. It’s what you get when you have the geographic requirements they have. They are in the same league as SSNs, at least price wise. Actually Britain has more sea area to cover than Australia.. including British over seas territory’s that we also protect. Two Astute subs could sink the entire Australian navy, numbers aren’t everything. Also Australia is the size of Europe. That’s a lot of airspace and sea to patrol. Australia is a continental sized country. It will certainly need that nr of planes. Its subs are not nuclear powered are they? We should build another carrier and share it with Australia. If we had Indonesia to our north and no friends we would be buying kit hand over fist. Our order is great news, along with the P8s and other ISTAR assets we have some fantastic kit in that area. What I would like to see happen is greater mass in the 2 areas that really make a difference in war. I see that as the SSN fleet and fast jets. A greater number of Astutes and Typhoons/F35s would increase the lethality of our armed forces no end. A lot great kit manned by professional men and women, just not quite enough in some key areas in my opinion (for what that is worth!). What Point of procuring more Typhoons!! Still more then half of Typhoons procured, are in storage, because of shortage of crews! Very interesting that it has Elint capability. We lost gold standard with the 3 R1s when they were cut. And I thought the RC135 is more of a sigint aircraft. 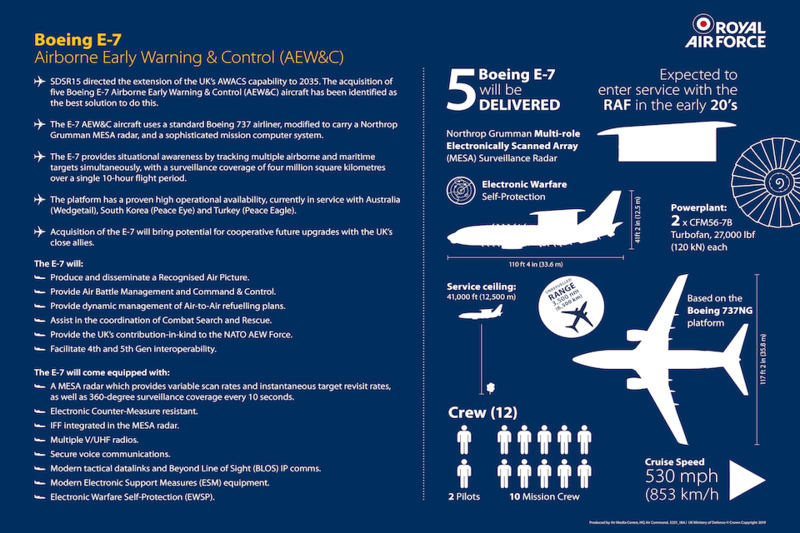 ELINT and EW are some of the few areas we invest in to a more than adequate level. True but policing the UKGIP gap is a job for the whole of Europe and North America, Russia can’t repalce its SSN’s and while its SSK’s are decent they have difficulty operating in the Atlantic. On that basis our ASW capability is more than sufficient for home defence. Russian SSK’s would also have to get past NATO SSK’s which are far more capable and numerous in the Baltic and the Black Sea. That being said I think we should very much invest in USV like Orca. They improve the capability of SSN’s and ASW frigates. I am becoming slightly concerned, if I understand correctly the E-7 and for that matter the P-8 use the boom method of in flight refueling however Voyager does not have this capability. Does that mean that the RAF would need to have US tanker support or are we going to buy this capability in. My understanding is that the P-8 cannot be configured for the RAF method of refueling so I suspect that the E-7 will have the same issue, any thoughts. Unfortunately that’s exactly what it means however I would expect to see a switch at the MOD very soon. The aircraft we have can be refitted very quickly. Training is a bit of an issue but Australia will help us out. Also the UK tends not to need A2A refueling for large aircraft as we have numerous overseas bases and we don’t have to cross the Atlantic to get anywhere like the USAF. Nope, that’s not true. It’s just the Boeing safety case for underwriting the modification is too much. Another massive Boeing mark up trying to squeeze as much out of the HMG cash cow as possible. The P8 delivery team have a choice integrate certain weapons or pay for the probe modification. There’s no extra cash, so weapons integration has been chosen. Does the plane have to go upside down to use it’s radar when scanning the ground? So does the plane need to fly upside down for it to scan the ground?